The Roman Empire at its height in the 2nd century CE covered territories stretching from England all the way to the Middle East. With 2.2 million square miles of land and a population of 65 million citizens managing such a large empire before our many modern conveniences is truly impressive. Roman influence on western civilization stretches across the centuries. As one of the world’s greatest empires, they are a popular topic in fiction. 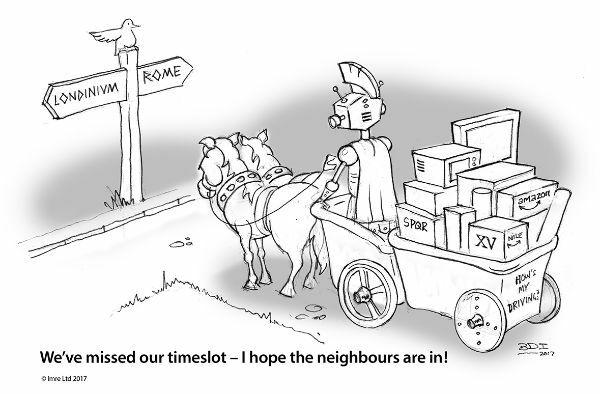 Many sci-fi writers imagine the Romans in different settings, alternative timelines, and with modern (or future) technology. Artificial intelligence long the topic of fantasy is becoming closer to reality. To better visualize how AI could affect the modern world you should consider how such a tool would have been used by the highly efficient and bureaucratically organized Roman Empire. Much like your local government offices, the Romans had their own bureaucratic offices to manage. However, due to the sheer scope of the empire itself how successful said officers were was often entirely up to the local leadership and those who served under them. The inability for one person to manage such a large empire and be up to date on information concerning local matters eventually resulted in a two emperor system managing east and west. One of the best uses of AI currently is in reviewing and tracking information. An Emperor would surely have appreciated complex data sets being examined by an AI system that broke it down into simple and relevant points. Managing an empire of over 2.2 million square miles is difficult and more so in a time before modern transportation and communication. The Roman road system, in particular, is historically noted for it quality. With access to AI systems automation of road upkeep and repair could be an idea Romans would be interested in implementing. This would have allowed the Romans to save on manpower, time, and transportation of workers while still maintaining the easily traveled road system that their far-reaching state had become reliant on. One of the noted consequences of the empire’s fall in the west was the degeneration of the road system making travel dangerous, reducing trade, and isolating communities. The application of AI to transportation is one of its uses we are seeing today. Bad information is often caused by not having up to date facts. More than once wars had broken out in the Roman Empire due to misinformation. For example pretenders to the throne fighting over the right to be emperor while the last emperor was still alive due to rumors that they were not. Also much like a modern government, the Romans took a census and collected taxes. However, the accuracy of this information was often reliant on the local governor and other political agents. Modern AI systems have been tested in the recording and maintaining of large databases and in the finance industry. Romans would likely find such applications very useful for keeping track of their citizens, collecting tax revenue, verification of current government activities, and maintaining army enrollment information. The challenges the Romans encountered while unique for their place in history are not too dissimilar to the challenges modern states face today. The technology may have changed but the need for proper transportation, government management, and the streamlining of government systems are easily applicable to today. The greatest benefit to AI systems may be their potential to streamline basic tasks and keep large databases of information current and error free. The Romans would have certainly found a use for tools such as this.